I had such a lot of fun celebrating World Book Day this week! I’m currently working on the Blue Peter Book Awards, which Booktrust manage, and we announced the winner’s of this years awards on the show on World Book Day. This year, Best Story was awarded to the fab The Spy Who Loved School Dinners by Pamela Butchart and Thomas Flintham, and Best Book With Facts went to The Side-Splitting Book of Silly Stuff by Andy Seed and Scott Garrett. Find out more about the Awards. One of the nicest things about the Blue Peter Book Awards is that the overall winners are voted for by over 200 children in schools around the UK, and some of them were in the studio to meet the winners. 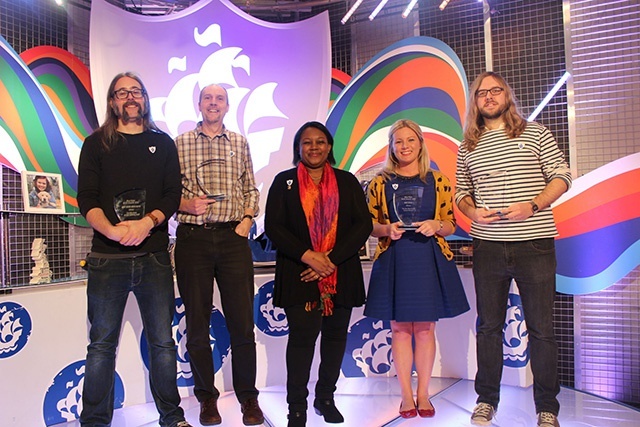 Malorie Blackman was also on the show to present the winners with their awards, and was surprised by Blue Peter’s highest accolade – the gold Blue Peter badge! 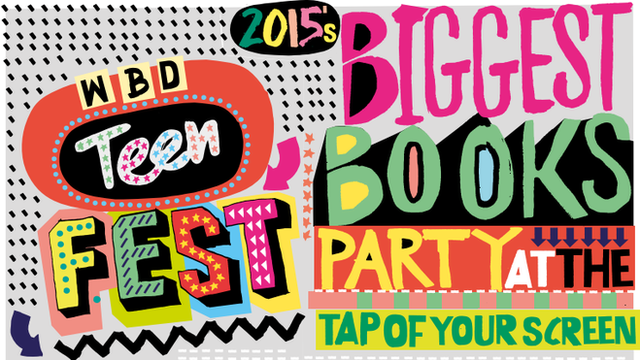 Meanwhile, back in London, I was delighted to be taking part in the World Book Day TeenFest. This event for teen readers took place on 4&5 March, and included a whole range of online activity, including hangouts, interviews, blogposts, playlists and more. I had the chance to interview the brilliant young adult author Non Pratt for TeenFest. Here we are, trying to understand out how Google Hangout works, revealing the amazing cover for Non’s new book Remix (which publishes on the same day as The Mystery of the Clockwork Sparrow!) and laughing quite a lot.